Organizations need a clear governance framework to function effectively. The framework should clarify the role of the governing body – and the role of staff. This tool provides an example of a governance framework that can help agencies achieve a high level of performance. Governing boards clearly have ultimate decision-making authority for everything under their guidance. But in actual practice, many boards don’t exercise that authority. Staff often drafts recommendations and brings them to the board to ratify. This may be efficient, but it casts the board in the role of “rubber stamping.” Over time, this erodes trust between board and staff. On the other hand, some governing directors can push their agency to follow their personal agendas, without clear limits on what they can do. This problem can be particularly acute in publicly-elected boards and councils (think of your city council or county board of supervisors) where the lack of a framework often leads to a breakdown in communication and ultimately public trust. The solution is to create a governance framework that clarifies the roles and responsibilities of the governing board and of staff. With the right framework in place, a board can sharpen its focus – and the overall focus of the organization it serves. This group of 10-20 policies defines what the governing board is responsible for doing, the expectations of board members, how board members are chosen, and how committees are formed and their function. These policies also define a code of behavior for board members and address conflict of interest questions. This group of 10-15 policies defines the relationship between the board and the chief executive officer or general manager. 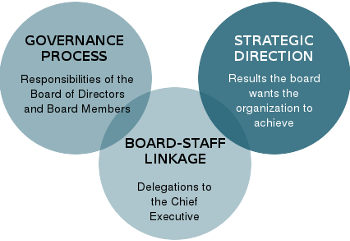 One policy clarifies the “unity of control,” meaning that only the board, acting as a board, can direct the chief executive. Other policies define the exact terms of delegation to the chief executive. This third and final group of policies defines the results that the board wants the organization to achieve. Some typical areas of focus include customer satisfaction, product reliability, finance, environmental protection, and workforce development. Each policy should include quantifiable metrics and targets. This framework will be familiar to people who know John Carver’s governance model – with one exception. In place of a fourth set of “executive limitation” policies, which are defined in Carver’s model as things the executive shall not do, this framework embeds performance goals in a positive manner, via metrics and targets in the strategic direction policies.